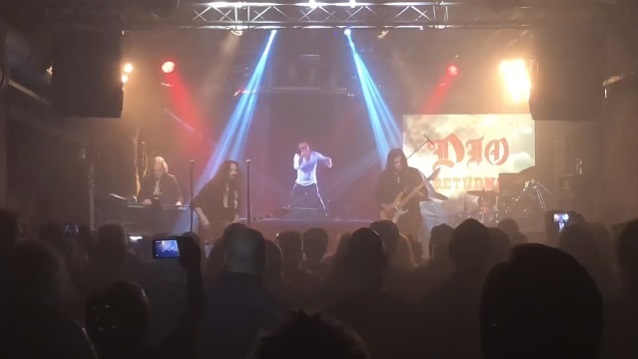 "Dio Returns: The World Tour" — featuring Ronnie James Dio reuniting via hologram with his DIO bandmates — kicked off earlier tonight (Wednesday, December 6) at Matrix in in Bochum, Germany. The Ronnie hologram performed throughout the show, treating fans to an alternating setlist that featured songs such as "Rainbow In The Dark", "We Rock", "Neon Nights", "King Of Rock And Roll", "Man On The Silver Mountain", "Heaven And Hell", "Holy Diver" and more. The "Dio Returns" tour features Ronnie's actual live vocals, with the DIO band playing live, consisting of Craig Goldy on guitar, Simon Wright on drums and Scott Warren on keyboards, along with Bjorn Englen on bass. Veteran metal vocalist Tim "Ripper" Owens (JUDAS PRIEST) is also performing, with singer Oni Logan (LYNCH MOB) also joining on select dates. "Dio Returns: The World Tour" will also make stops in Poland, Spain, Romania, United Kingdom, Netherlands and Belgium before the end of 2017. Dates initially announced for Finland, Sweden and Norway are being rescheduled for a larger run through Scandinavia in 2018. 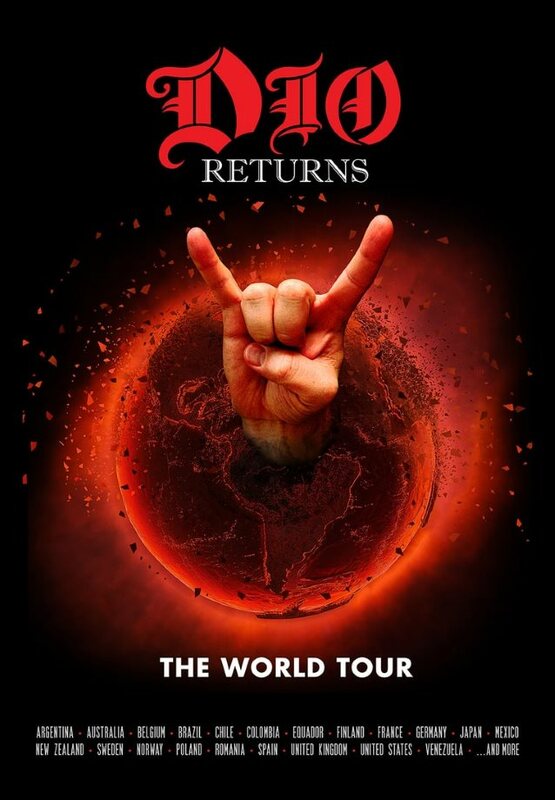 The "Dio Returns" tour will also make stops throughout Argentina, Australia, Brazil, Canada, Chile, Colombia, Ecuador, France, Germany, Japan, Mexico, New Zealand, United States, Venezuela and other countries, with more dates to be announced. The hologram of Ronnie James Dio made its debut at last year's Wacken Open Air festival in Germany. The surprise appearance of the heavy metal icon during DIO DISCIPLES' set closed out the massive metal event which was attended by more than 75,000 fans. In a recent post on the DIO DISCIPLES Facebook page, Goldy defended DIO DISCIPLES' decision to tour with Ronnie's hologram, calling it "a gift to the fans" which will be "given in the same spirit in which Ronnie gave." He explained: "People don't remember, but Wendy [Dio, Ronnie's wife and manager] was a big part of how that whole 'Sacred Heart' stage set was built, put together and without hiking up the ticket prices too. Same thing for the 'Dream Evil' tour, with a giant metal spider that came down out of the rafters and I shot it with lasers out of my guitar and then wherever I pointed my guitar, an explosion would occur. It was magical days with magical people behind that magic. This hologram is just that." According to Goldy, DIO DISCIPLES' performances with the Ronnie James Dio hologram will serve an opportunity for people who "never got to see Ronnie on stage with BLACK SABBATH and RAINBOW" to experience some of the original magic. "This is something that is done in the name of love, honor, missing him and respect — nothing else," he said. "And that is the truth. People's opinion does not alter the truth. It only alters the perception of truth. So this hologram tour is meant to honor the man and his music in the same spirit in which that man gave to this world... so we now give. And people will be missing out on an incredible experience if they let bad comments make that decision for them." Craig added that "Ronnie would approve of this hologram being done in the way it is being done. I'm sure that anyone who has worked as hard as he did, and has made as big of a worldwide impact as he did, would like their name and memory carried on by those people that he loved and surrounded himself with by choice." Englen told "The Blairing Out With Eric Blair Show" in October that "Dio Returns" will see him and his bandmates perform "quite a few songs with the hologram — probably, I would say, about half or maybe more than half. And then the rest of them are gonna be without the hologram, with 'Ripper' Owens and Oni Logan singing," he said. "So it's gonna be the DIO DISCIPLES. And the hologram is gonna be in the middle of the stage, but I don't wanna reveal too much. It's quite a large… it needs quite a bit of space onstage, so hopefully most of the venues are gonna be able to accommodate that, as far as the places that haven't been booked yet. But we're excited about it. It's gonna be great." According to Englen, the tour will consist of shows "at theaters and large clubs. And as long as the stage is big, we can do it. It has to have a certain width," he explained. Regarding what is involved in planning a tour like this, Englen said: "We have to do some choreography, as far as where to be and what song and all that stuff. All the music is live, and we obviously have to play to a click track — or Simon does — so that we're synced with Ronnie's vocals. Other than that, we play the songs like we normally play them. We've just gotta make sure the arrangements are the same, and they usually are — we haven't done many changes to the songs since the DIO days. So they're the same anyway." Asked if he finds it "haunting" to perform with a Dio hologram, the bassist said: "You know, we're not really looking at it while we're playing. Looking at it after, I think it's just a nice thing. Some people wonder, 'Is it creepy?' or that kind of a thing. We're excited. We feel good about it. It's done really well, and it's with live vocals — you know, you get that live feel and everything — and they've done a really nice job as far as the content and the photography and all that stuff. I think a lot of people are gonna be — even the people that have been negative about it, or pessimistic — are gonna be positively surprised."